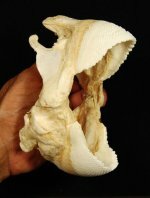 SOLD Sea Critters : Fossils Online, Welcome! Absolutely massive. The only one I have ever offered or seen for that matter. Measures 5" high and 3 7/8" wide. Caught in the Philippines. Absolutely massive. Only the second that I have offered. Measures 5 1/2" high and 3 1/2" wide. Caught in the Philippines. Very nice beak from a very large squid in the 50-60 pound range. Very nice beak from a very large squid of 50-60 pounds! Very nice beak from a very large squid. Excellent crab that measures 14" x 10".